For those that use Vim as an editor and ant as a build tool, is is common to set your Vim ‘makeprg’ option to execute ant so that you may navigate compilation errors via Vim’s quickfix functionality. Eclim utilizes this same paradigm to provide users with ant execution functionality from any file without any of the setup required by Vim. Saves any previous ‘makeprg’ and ‘errorformat’ option settings so that you can define your own settings for the :make command. Sets ‘makeprg’ to execute ant with the -find option so that it will search for your build.xml file in the current directory or in a parent directory. Restores your previous ‘makeprg’ and ‘errorformat’ option settings. Additionally, if g:EclimMakeLCD is enabled (which it is by default), then the execution of ant will be performed from the current buffer’s project root directory, ensuring that ant’s build file discovery method is performed from the buffer’s working directory and not your own. :Ant also supports use of ‘!’ (:Ant!) 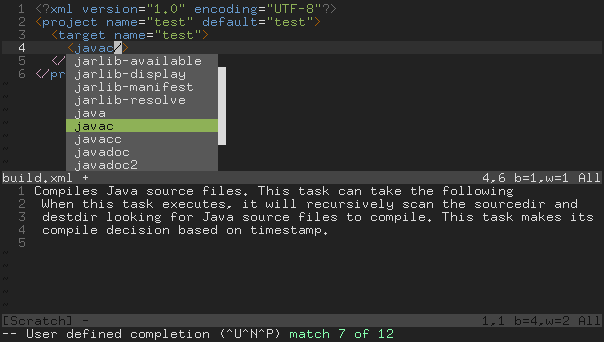 just like :make does, which tells Vim not to jump to the first error if one exists. The :Ant command also has the added benefit of command completion. If your ant file has a lot of imports, then the command completion may be slow as Eclipse parses all the imports when creating the ant model. You will notice the same slow behavior when using Eclipse directly to perform ant code completion. If your ant file has a lot of imports, then the code completion may be slow as Eclipse parses all the imports when creating the ant model. You will notice the same slow behavior when using Eclipse directly. When editing an ant xml file eclim will default to validating the file when it is written. Any errors will be added to the current window’s location list (:help location-list) and their corresponding line number noted via Vim’s sign functionality. If a default target is specified, validate that it exists and that the target dependencies exist. Eclim also combines the above validation with xml validation to validate that the ant file is well formed. If you do not want your ant files validated automatically when saved, you can set the g:EclimAntValidate variable described in the configuration section below. Whether or not auto validation has been enabled, eclim also exposes the command :Validate to manually execute the validation of the ant file. When editing an ant build file eclim defines a command named :AntDoc which will attempt to lookup and open in your configured browser the documentation for the element under the cursor or, if supplied, the element passed to it. This command will only lookup element names, not attribute names or values. By default this plugin is configured to find all the standard ant tasks, types, etc, as well as those defined by the antcontrib project. If you have other tasks that you wish to add to this plugin, you can do so by defining the global variable g:EclimAntUserDocs. The value of this variable is expected to be a map of element names to the url where the documentation for that element can be found. The url also supports a substitution variable, <element> which will be substituted with the lower case version of the element name. The following is an example which adds the tasks from the apache cactus project. g:EclimAntCompilerAdditionalErrorFormat (Default: ‘’) - Since there are many more ant tasks beyond javac, javadoc, etc., eclim provides this variable as a means to add error format information for any additional ant tasks that you may be using. \ '\%A%.%#[xslt]\ Loading\ stylesheet\ %f,' . The xslt task is a bit flaky when it comes to reporting the file name on errors, so the above format will catch successful runs as well. If anyone has a better solution, please submit it. g:EclimAntErrorsEnabled (Default: 0) - When non-zero, build file error messages will be added to vim’s quickfix if encountered during :Ant invocations. Disabled by default because it’s difficult to distinguish between actual issues with the build file (invalid property, task, etc.) and build failure messages which occur under normal usage (junit task failed due to test failure, javac failures due to compile error, etc.) leading to false positives. g:EclimAntValidate (Default: 1) - If set to 0, disables ant xml validation when saving the file. Here are some mappings for the ant funtionality provided by eclim. To make use of these mappings, simply create a ftplugin file for ant and place your mappings there (:help ftplugin-name). Lookup and open the documentation for the ant element under the cursor with <enter>.